These are upright varieties and mostly broad leaf. Asahi Zuru - This cultivar has creamy-white leaves with pink in the spring. Bloodgood - Is very reliable for its deep red color thru summer. Crimson in fall. Butterfly - Varigated leaf cream with pink and a magenta fall color. Beni Ubi Gohan - Small, red-leafed, perfect for containers. Scarlet fall color. Burgundy Lace - Small rounded tree with Burgundy red leaves. Bright red fall color. Emperor 1 - More tolerant of heat than Bloodgood. Bright red fall color. Kiyohime-Yatsubusa - Shrub-like, 4'x 10' with red-edged leaves and yellow centers. Orido Nishiki - Round-topped tree, variegated leaves. Reddish-maroon in fall. Osakazuki - Green leaves in summer. Brilliant fall color-fiery crimson-red leaves. Peaches & Cream - Creamy-white leaves with dark green veins. Fall color is Yellow. Red Wood - Red - twigged, foliage green in summer, yellow/pink in Autumn. Villa Taranto - Leaves orange-red early, green summer. Fall brilliant yellow/orange. Red Pygmy - Small- vivid red in spring-red to purple in summer and orange is Fall. Shindeshojo - Flaming red in spring, Orange/red Fall. Classy medium sized tree. Trompenberg - Sturdy upright shiny red-leafed palmatum. Fast growing. Fireglow - New growth bright cherry red- darkens thru summer without fading. Skeeter's Broom - Narrow upright shrub- bright red to burgundy - bright red fall. Ueno Yama - Orange/yellow spring - summer green-Yellow/orange fall. Upright. Scolpendrifolium - full sun. Deep green leaf that in full sun bronzes to shades of red. Ever Red - Ever changing color-silver to deep red to crimson in the fall. Very Cool. These varieties are more shrub-like and lace leafed. Red Dragon - Scarlet spring to fiery red fall. Excellent in small gardens. Garnet - Deep red-orange color. Holds well in summer. Best in full sun. Crimson Queen - Dark purple-red leaves to bright red in fall. Excellent performer. Orangeola - Bright orange-red spring. Red fall color/ orange bronze overtones. We guarantee our trees to be in good health when they leave us. 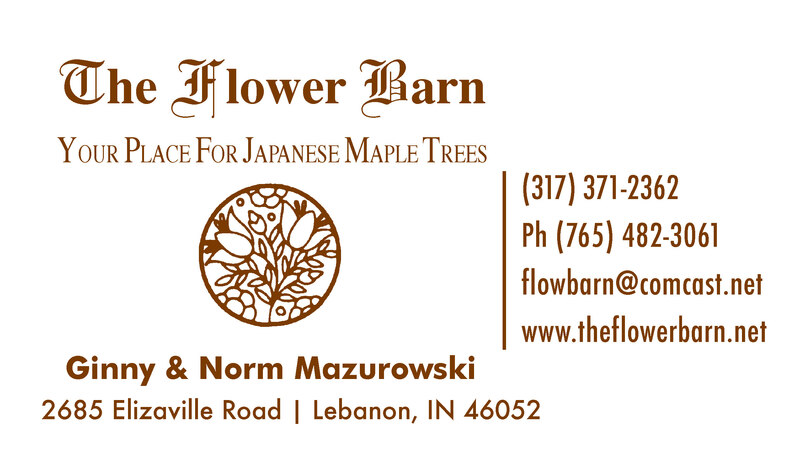 Please notify us within one month if your tree fails to thrive and we will replace your same tree if possible. We are available by appointment for other days and hours. We will resume regular hours beginning September 9, 2017.